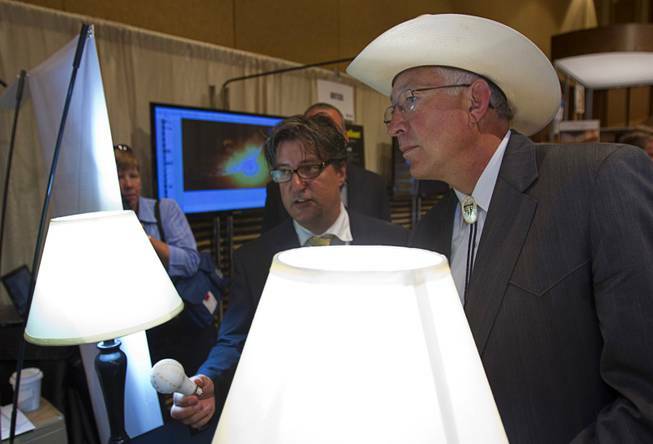 This week in Las Vegas a local company, BriteSol, unveiled the Holy Grail of lighting technology. BriteSol has developed breakthrough LED lighting technologies for a wide range of applications that run at dramatically low energy costs, with almost no heat generation, and with expected lifetimes in excess of 1 million hours. When compared with other available LED lighting solutions, some BriteSol lighting products realize energy savings of over 90 percent. Representing the first truly sustainable lighting in the world, all BriteSol lighting products are manufactured out of 100 percent recycled materials, with the chipset being the sole exception. With a lifetime of over one million hours they are not disposable. Taking the sustainable business model one step further, all BriteSol products are being manufactured in the country they are being used in, striking international shipping from the equation and the resulting energy and carbon costs generated when products are transported around the globe. BriteSol is determined to light the way to a better, cleaner, sustainable future. BriteSol is not only going to provide the world's first sustainable affordable lighting, it is also going to provide a socially and environmentally conscious business model for the future. Not satisfied with simply turning the global lighting market on its head with their products and distribution model, BriteSol is also providing its lighting to developing countries free of charge through their associated philanthropic foundation the Kre84all Foundation. The company is monetizing its products in developed markets, but even there the price structure for their lighting will be less than half of the cost for the significantly inferior products that are currently available. Even more amazing, its inventor and CEO Daniel Lang and Kre84all have developed a way to solve the acute problem of spent nuclear fuel rods which are highly radioactive, remain extremely toxic for 200,000 years and require significant resources to securely store safely, exceeding $96 billion annually. 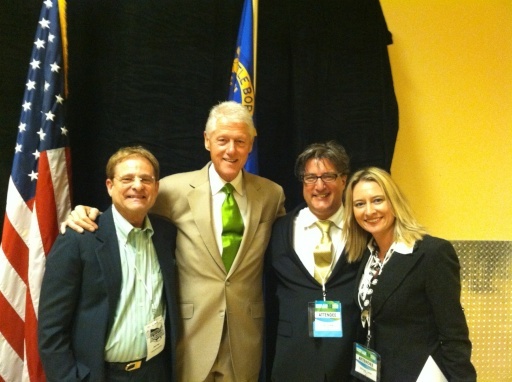 I spoke with BriteSol inventor and CEO Daniel Lang just after he met with former President Bill Clinton and Secretary of the Interior Ken Salazar in Las Vegas after introducing BriteSol at Harry Reid's National Clean Energy Summit. You had a big day in Las Vegas. Yes. We were under wraps until May, and then our patent attorneys said, "Okay, you can go out now," but we kept it under wraps for the most part since we wanted to have a big opening today and it was very successful. We had a meeting with President Bill Clinton, who was very interested in the technology. So we started the ball rolling of working together, which is a good thing because we would like to help him in his efforts to do the great work he is doing. Specifically what work is that? Bringing up developing countries without having them go through the industrial mess we have. So, bringing renewable energy, efficient products and our food systems for urban farming as well as our off-grid lighting. Also the cleaning up of spent nuclear fuel rods. Okay, let's back up a bit. Explain the significance of the technology you introduced today. There were three that we actually introduced. One is lighting. What we have done with lighting is take the usage of energy for the lighting down to between one and ten percent of current technologies far exceeding that of the latest LED technology. More importantly the products are built from recycled material except for the chips themselves and have over a million hour life span, making it truly non-disposable light. We are going to be manufacturing these products locally to locals so if we are selling them in the U.S. we are making them in the U.S., if we are selling them in China then we are making them in China. We are also giving a lifetime guarantee on all of our products. Then for the undeveloped world -- we are donating our products to raise them up to the standards of living that we have. Let me give you an example. We have a new street light called ViaLite, currently the best LED streetlight on the market uses 134 watts, ours uses a watt and a half (1.5 watts). It meets IES specifications. It uses an outdoor approved solar photovoltaic film that we actually improved by a factor of three. Our streetlight, since it only uses a watt and a half or only 13 watts over an entire night, the solar PV that we put on that pole in the Northeast of our country generates 350 watts of power a day so now you have a streetlight that produces more power than it uses. We also have an agricultural light for urban farming that makes it possible now to grow plants indoors since there is no heat, they consume very little energy and we have matched the spectrum of the light for the individual plants. What we do is we look at the plant species that we want to grow and we go back to where that species evolved -- where it became successful not where we grow it today -- and then we build growth cells where we give them the nutrients and water. They are completely sealed biospheres basically and we use NASA aeroponics augmented with a solid state delivery system instead of using pumps because pumps break. We use oxygen to deliver the nutrient-rich water to the roots at a certain temperature based on the species natural environment. We keep control over the different temperature at the roots and the leaf thermoelectrically It is the same technology we will be using in our next launch which is heating and cooling. If we can do it for plants we can do it for humans. How about the nuclear issue you mentioned? In our private meeting with the President (Clinton) we also discussed nuclear fuel rods -- in this country we have about 67,000 metric tons of spent nuclear fuel rods sitting in pools and cooling casks with no logical solution of what we are going to do with it. Every single nuclear power plant produces another 2,000 metric tons every year. I have in my patent, which has been vetted by a number of physicists, a safe storage solution that also makes a profitable revenue stream and it is ready to go today. The U.S. is just one of many countries with the same problem. So he was very excited about it as well. What is your proposal in terms of utilizing the spent fuel rods? One of the problems with spent fuel rod storage is that it costs us money to keep them cool. Eventually some bean counter somewhere is going to think that they can cut some costs by reducing a safety measure and it is going to turn into a catastrophe for the whole planet. My invention basically contains a method that allows us to produce electricity because they are radiating heat. The heat is not used to run a turbine, it is a solid state system that uses a containment method to extract and convert the rods heat into thermoelectric energy. At the core we convert the radiation into electricity through layers that employ thermophotovoltaic, alfavoltaic, and betavoltaic processes that generate electricity, leaving the remaining layers shielded from radiation. Then we basically convert all the thermal heat into electrical energy through different thermoelectric material layers as the heat travels through them. This way, instead of paying to run pumps to continually exchange cold water to cool these rods of their heat, we are instead using that heat and converting it into electricity while shielding the radiation. The other byproduct we get from the containment system is organic phase change materials heated to certain temperatures that are the heat dumps of the system. By cycling out these heated non-toxic materials and delivering them to say a glass manufacturing plant the plant no longer has to use electrical energy or coal or gas to generate heat at their plant where they want the heat and not be heating up their entire plant as they do now with industrial furnaces. The heat can be delivered safely in containers so now they can use the waste thermal heat that came off the spent fuel rods cheaper than generating heat themselves -- it's a secondary industry. Obviously you have an ample inventory around the world to work with, that is simply brilliant. When do you expect to bring these various products and solutions to market? Very soon. We have a number of manufacturers for the lighting that are ready to go. We have a huge demand already for preorders. Ninety days, we want to move as quickly as possible. For the nuclear invention that's going to take a while. There is the infrastructure of the Nuclear Regulatory Commission. However, so many countries have a similar problem and many of those countries don't have the red tape we have, we feel we get it implemented somewhere else first as a test. So we are looking for help from organizations like the Clinton Foundation and a number of others to help us gift that technology to the world. It's for all of our children and grandchildren to actually have a safe planet so we are not looking to monetize it. If they can just get it done I'm happy. That is one aspect of your business model that intrigues me. The whole underlying philosophy of being socially responsible and while some of the products are monetized the overriding philosophy seems to be about improving not only the efficiency of the lighting but getting off the grid and off coal fired power and other dirty fuel sources. Absolutely correct. I joke with everybody that I am putting myself out of business in every single industry I am going into, but that's a good thing. If these staples of life that we are fighting over are no longer a cost for generations we won't be fighting over simple things like this anymore. If we could raise humanity all across the globe to a sustainable level without destroying our planet, I would pay every penny I have ever made or will make to have that happen. What has been the process to make this happen? How long have you been focused on making this a reality? I came up with the idea back in 2004. It was not until I met my wife Stacey that I made the real commitment to do this. Prior to that point I was very jaded after seeing how difficult it was to have ideas move forward and I thought humanity talks a big talk but they don't seem to want to get behind anything that's really going to make a difference unless they can see big profits. Stacey had the idea of making business a charity and I said that was actually the best idea I had ever heard. Basically, let's do this completely backwards and not worry about the commercialization of this. Let's go out from a charity basis and walk the walk basically. It's been a struggle. We came out here (Las Vegas) in 2009. We shut down my business and sold everything in California. We decided to come out to Vegas because our money would take us further we could get space cheaper, employment was cheaper plus it was the worst city in the state for unemployment. We figured if we could help this state out they will take us seriously everywhere. In 2010 we started to play with the different technologies to decide which one to go out with first. Then we chose light in the summer of 2010 and filed the patents in November of 2010. Literally it's been from then until May getting through all the red tape of getting things secure without having a number of people steal things. It's been a crazy ride.